Believe it or not, it's been over twenty years since the publication of Understanding Comics, which established the breakthrough realization that the most effective way to truly explain how comics work is in comics form. Now, at last, we have the next iteration of this understanding: that the most effective way to explain how comics -- presented here as consciously thinking and writing - and, of course, reading - in a free flowing combination of images and text -- are changing the way we represent our world and understand ourselves is also in comics form. Unflattening, just published by Harvard University Press, is the book form of Sousanis's Columbia University dissertation, "Unflattening: A Visual-Verbal Inquiry into Learning in Many Dimensions" -- the first ever presented at the university entirely in a comics form. This work challenges the primacy of words over images in Western culture and asks readers to view them as equal partners. A book for our times, indeed. Here is a thoughtful reaction to the original dissertation by Sydni Dunn at Chronicle Vitea. 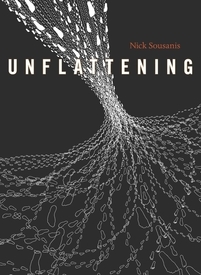 Learn more about Unflattening, and catch up with Mr. Sousanis at his website, Spin, Weave & Cut.